So when we read about the recent events at the University of Missouri, including the terrorization of Black students through death threats, hate speech, and physical acts of violence, we find that we must respond to calls of solidarity. There are only eight students in this program; we cannot stage a walkout or rally to much effect, and American anti-Blackness might fly over heads in Poland, a country so racially homogenous that only 0.1% of its population is people of color. What we can do is affirm our dedication as students and professors to critical education, abroad or at home. 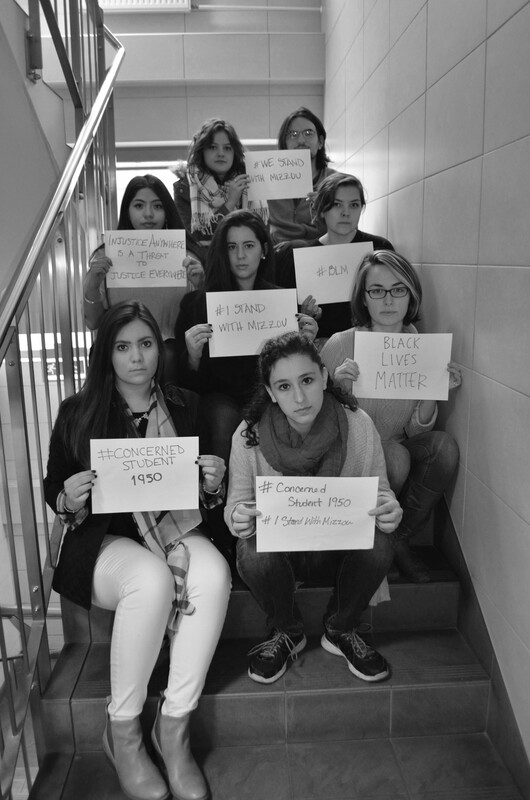 Among our group, there are no Black students, and this also means something. While diversity alone will not remediate our institutions of education, accessibility is a key component of justice. 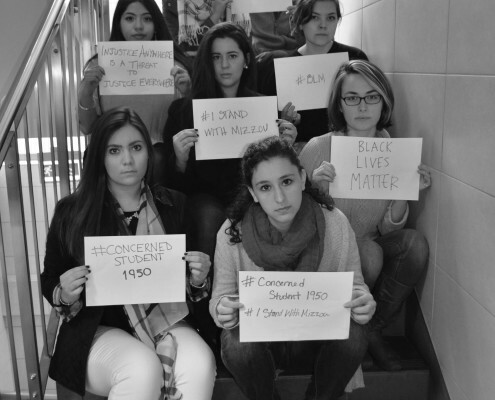 Syracuse University, our home institution, also has a lot of work to do in the way of racial justice. We challenge our peers, professors, and administrators to change the culture of racism decried by so many students of color, and we support the struggles and demands of students protesting at Mizzou. 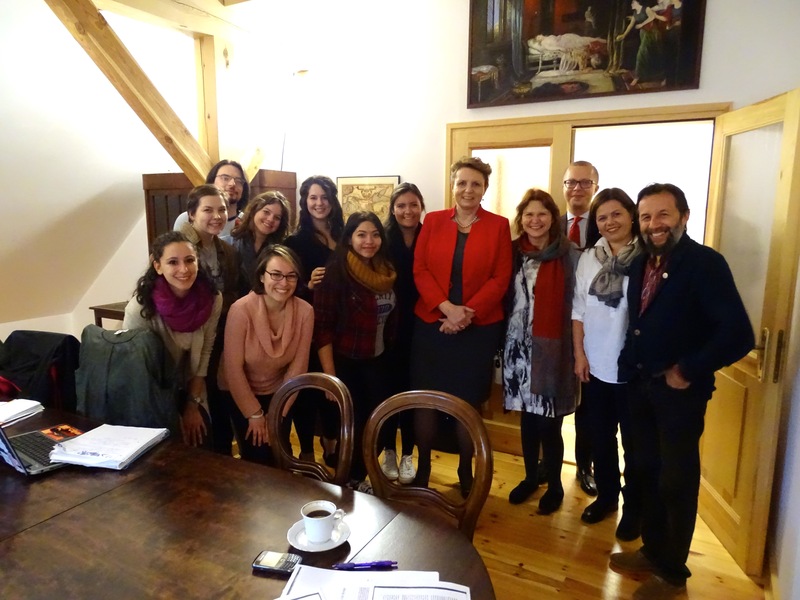 Participants of 2015 Culture and Politics of Reconciliation, Syracuse University Special Program in Central Europe with Poland’s Minister of Culture in Krasnogruda, Poland. 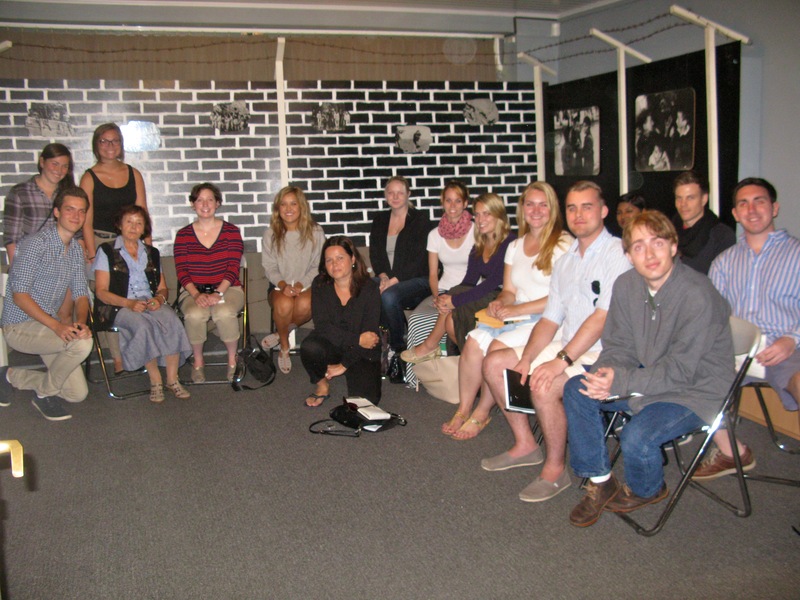 Front row from the left: Arielle Pressman, Farrell Greenwald Brenner. 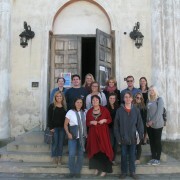 Second row from the left: Renata Husted, Erin Kenney, Katherine Vargas. Third Row from the left: Marcin Zak, Monica Pellerano, Domenica Vera, Malgorzata Omilanowska (Poland’s Minister of Culture), Malgorzata Sporek-Czyzewska (Co-founder of the Borderlands Foundation), Hana Cervinkova (SUA Program Director, University of Lower Silesia), Krzysztof Czyzewski (Co-founder of the Borderlands Foundation). 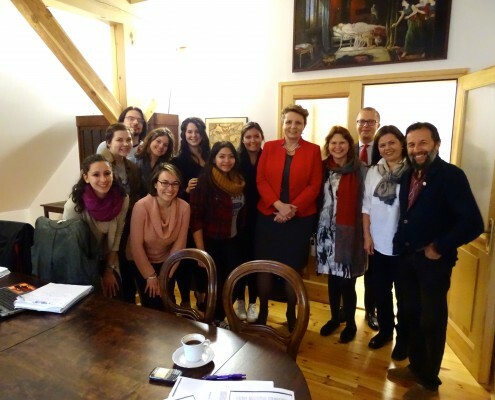 During our stay in Krasnogruda, near the town of Sejny, we had the honor and pleasure of meeting the Minister of Culture of Poland, Malgorzata Omilanowska. 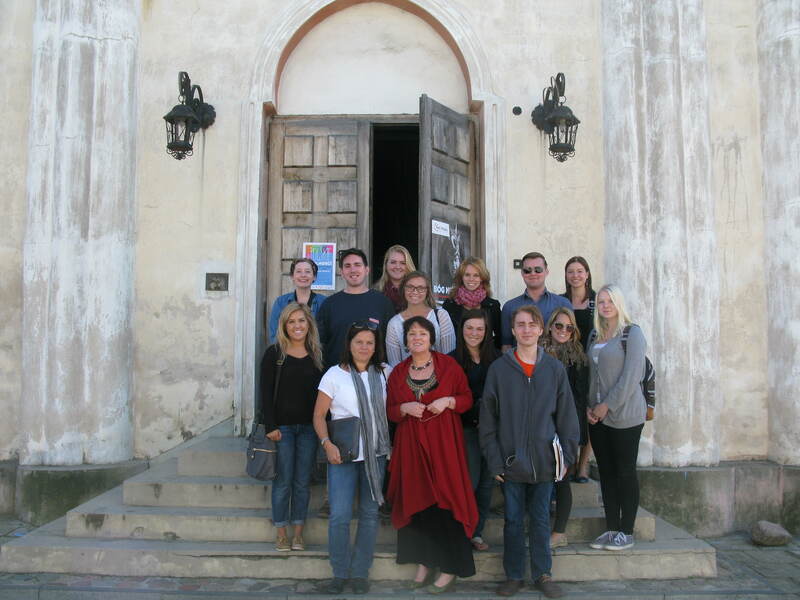 She was surprised to find a group of American students visiting the Borderland Foundation’s Center for International Dialogue, and questioned our reason for being here. She asked why we would choose to study in Poland when we could so easily study more comfortably back in Syracuse. 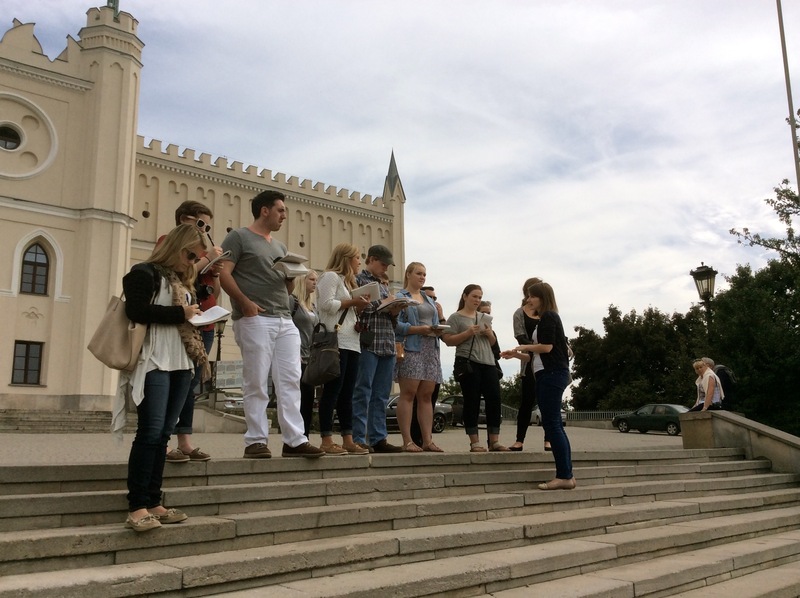 Some of us explained how being here, in Poland, cast a new light upon the historical and contemporary matters we are studying. Apart from the obvious distance involved in taking part as an outsider, physically inhabiting the same environments we are studying allows for an emotional connection; an engagement distance would otherwise disallow. 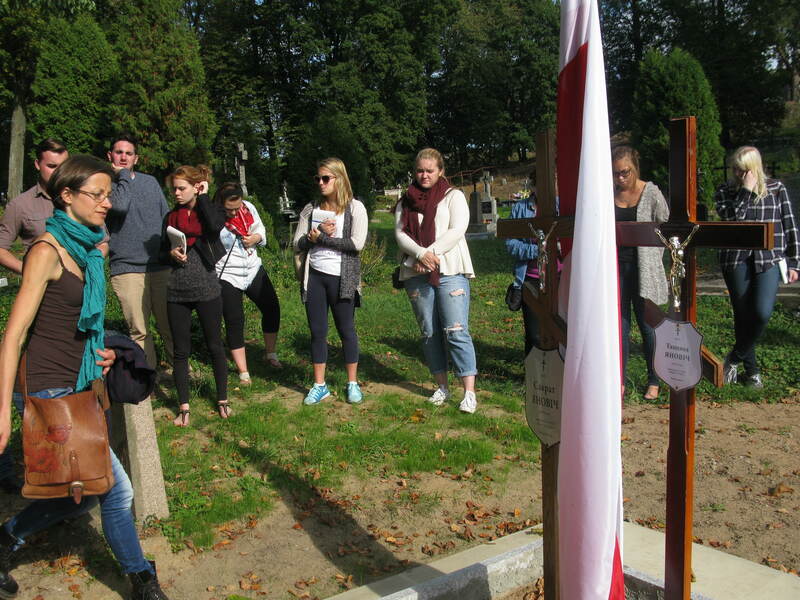 While the Holocaust history of Lublin is devastating, the current civil engagement built around the memory of a multicultural past is admirable and can inspire efforts in other places. 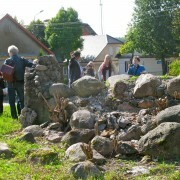 Since the 1990s the Grodzka Gate – NN Theater, a city-funded cultural institution, has undertaken an enormous effort at reassembling the history of a multicultural city by collecting archival materials, photographs and also oral histories and testimonies of people that live or once lived in the city. 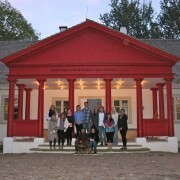 Located in the Grodzka Gate – once known popularly as the Jewish Gate – marking the passageway between Lublin’s Jewish and Christian worlds, this cultural institution has produced artistic and educational work aimed at building a shared future on a complex understanding of the history and memory of the past. 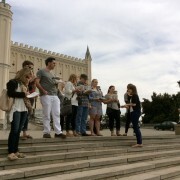 Guided tour of the -Lublin. 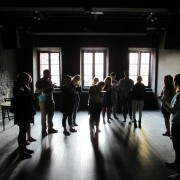 Memory of the Place- exhibition at the Grodzka Gate. efforts of other institutions and individuals we have met on our journey. Most strikingly, Grodzka Gate has given names to the city’s former residents. In its documentary work, Grodzka Gate has amassed an enormous database related to practically every home and building of the former Jewish districts of Lublin available to visitors to the museum and online. Through artistic installations, visitors can not only reconstruct in their minds the atmosphere of a multicultural city, but also understand the terrible emptiness of a city now deprived of a thriving community. The Grodzka Gate also applies this knowledge to work towards reconciliation, carrying out workshops with Polish and Israeli youth as well school groups from Lublin. The message from Lublin rests on the admirable cooperation between artists, cultural animators and the municipality, which have come together to address painful issues of the past with the view of their importance for the building of civil society and vital democracy. Before WWII, Krynki was an industrial town of as many as 9,000 citizens, most of whom earned their livelihoods working in the now-abandoned local tanneries. At least two-thirds of Krynki’s citizens were Jews, whose spiritual lives were centered around one of several prayer houses and synagogues in the town. Today, no Jews are left in the city and the material culture testifying to their former presence is in a devastated condition. 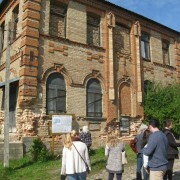 On a walking tour through town, our first guide, Cecylia Bach-Szczawinska, led us to the ruins of the former Great Synagogue and also to two sites of desecrated Jewish temples – the Caucasus Synagogue, which is a decrepit cultural center and former cinema, and the former Slonim Hassidic synagogue, whose private owner now uses it as a gym, and forbids anyone from visitation. 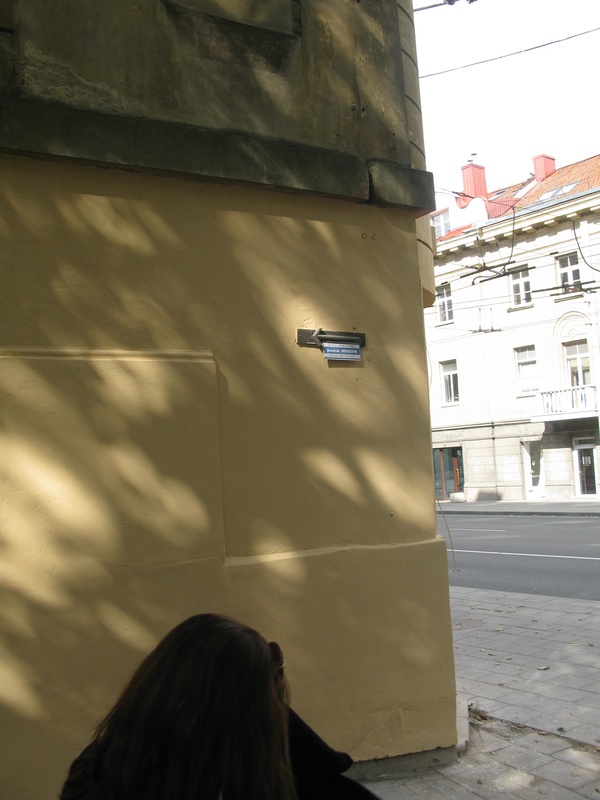 The impressions of mezuzahs still mark the doorframes of Krynki’s homes. Sadly, there is little in the town that shows any local attention or concern for past and a regard for the former co-inhabitants brutally murdered during the war. The lack of recognition and respect for their memory and this common heritage is especially perceivable in the destroyed and neglected Jewish cemetery, which was once the largest in the region after the Jewish cemetery in Bialystok. Today, only a handful of headstones stick out of the thickly overgrown slope of the cemetery located just a short walk from the town’s once bustling market square. Today’s Krynki is a shadow of its former self, administratively categorized as a village rather than a town. The silencing of past reverberates in current tense relations between the Polish majority and other minorities, such as the Belorussian and Orthodox communities, whose members expressed their sense of isolation and exclusion in the life and affairs of the locality. The feeling of isolation and abandonment were also apparent and expressed through the work of our two guides – one, Cecylia, who painstakingly documents the vanished Jewish past of the town, and Joanna, a Belarusian journalist and cultural activist, who in addition to making films and recording memories of inhabitants of their former Jewish neighbors, is also through music and poetry, attempting to salvage Belarusian culture and traditions from oblivion. The message from Krynki, thus, lies in the sharp contrast of the lack of memory and care for cultural heritage with other places we visited. 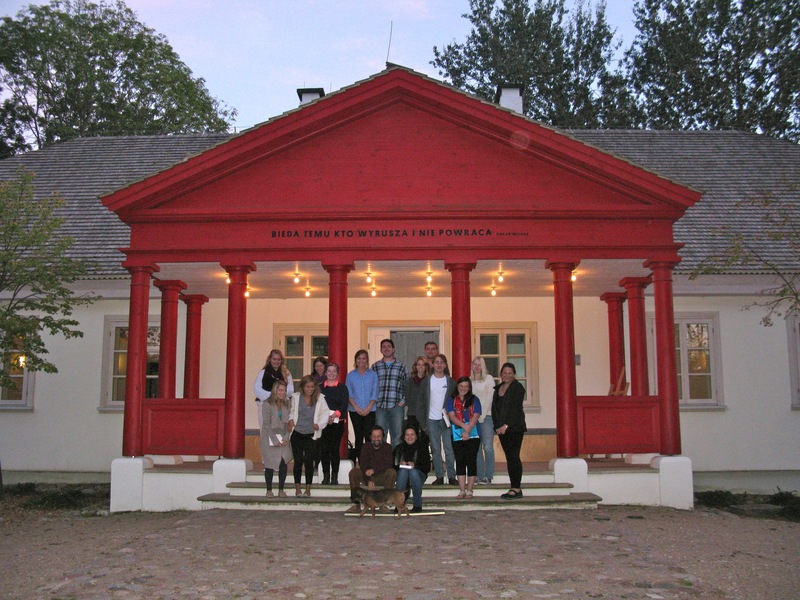 While in towns like Sejny or Lublin, organizations such as the Borderlands and the Grodzka Gate – NN Theater do remarkable work to uncover the past and educate citizens, in particular youth, about the importance of tolerance in today’s democratic Poland, in Krynki, dialogue and bridge building appear to be absent, a sore reminder of the tensions of the past, but also a potential source for misunderstandings and strife in the future. Our days of work and reflection with our friends at the Borderlands Foundation in Sejny coincided with sad news of the passing of Max Furmanski, the only surviving member of the once pre-WWII Jewish community of the small town located on the Polish-Lithuanian border. Born in Sejny in 1924, Max Furmanski avoided the fate of not only his family but the majority of the Polish Jewish citizens of Sejny. In escaping from Sejny, Furmanski promised to himself never to return. But 60 years after his departure, this accomplished cantor and musician embarked on a painful sojourn back to the land of his childhood. When he entered the synagogue where his dream of becoming a cantor was born, to his utter shock, instead of devastation, he encountered local children and other actors of the recently established Borderland Foundation rehearsing a production of the famous Yiddish play, the Dybbuk by S. Ansky. The serendipitous meeting of this witness of the past with nascent memory workers of the present was to become an inspirational source for the development of the Borderlands Foundation. As the only bridge to the pre-war Jewish community, through the common language of music, Furmanski helped the Borderlands piece together the rich heritage of Sejny’s past. Since these early encounters, the Borderlands Foundation has gone from a small, grass roots organization doing work on a local level to one of a global reach. But that work was only possible through the uncovering of Sejny’s multicultural past, a process facilitated to a great extent by key personalities like Max Furmanski or the Nobel Prize laureate Czeslaw Milosz, whom the Borderlanders refer to as their guides. 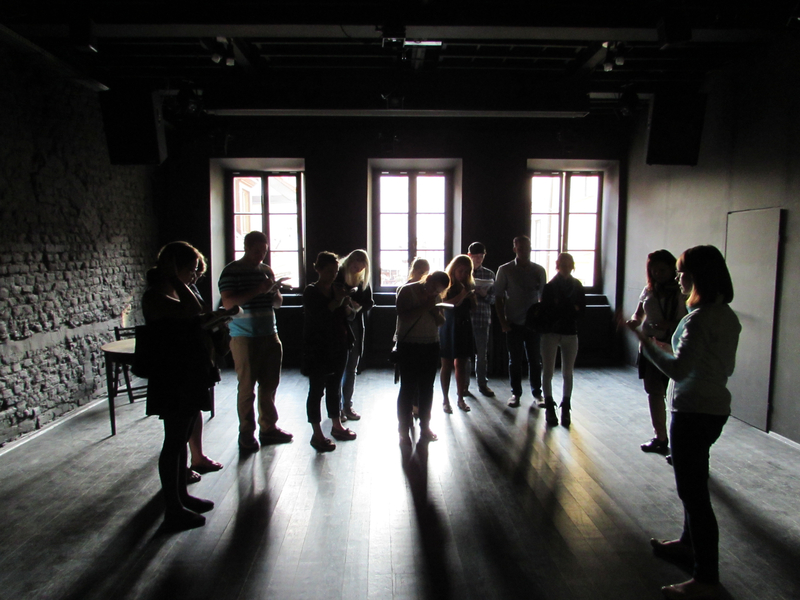 The message of Borderland Foundation reiterated in different forms through our workshops and meetings with artists and activists was the need to build bridges and “Agoras” – spaces of dialogue – that work against insularity, separation and xenophobia. This process, as Bozena Szroeder, a Borderland founder and educator, impressed upon us, requires patience and a longue duree approach as well as empathy in order to understand the sources of painful memories and conflicts, and identifying common paths to move forward. 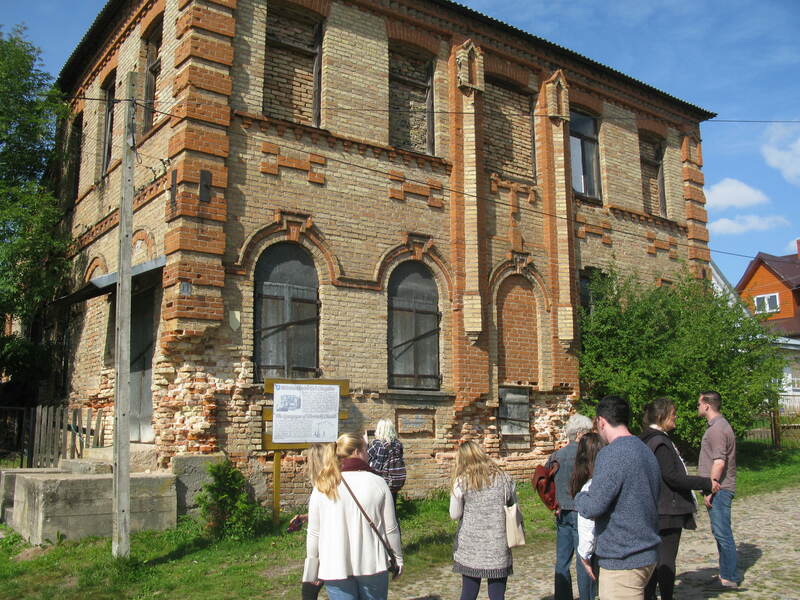 The once flourishing Jewish life in Vilnius came to an end in the Paneriai, a suburb of the Lithuanian capital, where beginning in the summer of 1941, six months before the Wannsee Conference, 72,000 mostly Lithuanian Jews were shot and buried in pits. Another 30,000 people lost their lives in the forest, mostly Polish intellectuals and members of the underground Home Army as well as Soviet POWs. Today the mass murder site is sparsely visited, in the least by Lithuanians themselves. (In August some 1,500 people, mostly from Israel, the United States and Poland, made their way to Paneriai.) A somewhat tentative national discussion has begun about not only the role of Lithuanians in the massacres, but also about the form of commemoration at the site itself. In 2014, an international competition “for comprehensive rearrangement of Paneriai Memorial” was announced and a commission is currently reviewing sixteen architectural concepts submitted by Lithuanian and foreign authors, some of which we viewed at the Tolerance Center at the Jewish State Museum. 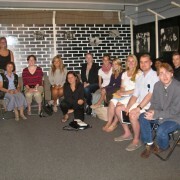 In the Holocaust Museum of Vilnius, also known as The Green House, we were extremely fortunate to have been met by Rachel Kostanian-Danzig, one of the creators of this important institution, which serves both as a documentation and educational center, and one of the very few places in the Lithuanian capital where one can learn about the decimation of Lithuanian Jewish community. In Rachel’s presence we came to appreciate the courage of civil engagement required to piece together a history on a topic that was deeply personal and tragic. As a Holocaust survivor who lost nearly fifty family members living in Vilnius, Rachel figures as a lonely but determined memory keeper and activist. The history of the Holocaust in Lithuania was silenced during the Soviet era. 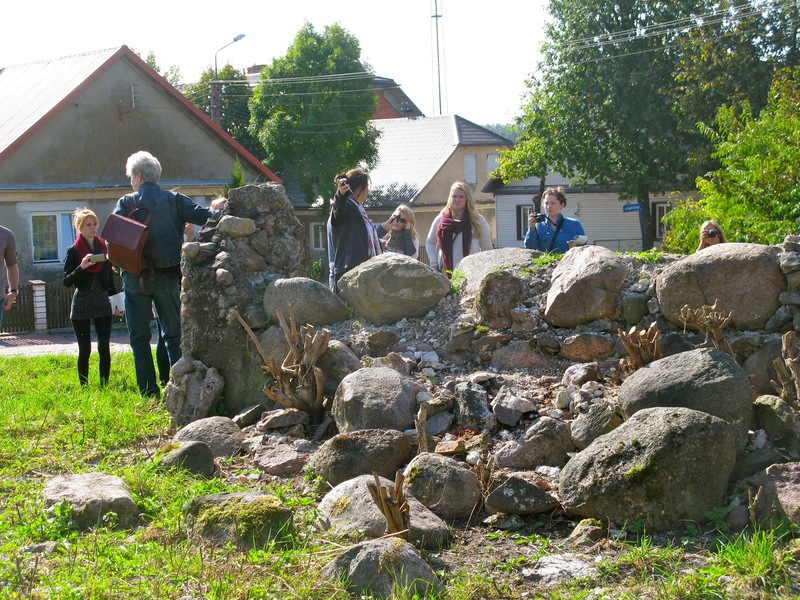 It was only thanks to few memory activists like Rachel that the story of the annihilation of the 600 year-old Lithuanian Jewish community could be pieced together and retold for future generations. As full as the history is told through documents and photos in The Green House, still today the Holocaust occupies only a marginal place in the today’s Lithuania. Sadly, the destruction of Lithuanian Jews appears to be almost absent in the national narrative in comparison to the focus given to the crimes of the Soviet era recounted in more prominent institutions of national memory, such as The Museum of Genocide Victims. This crowded museum, located in the former Secret Police headquarters in Vilnius stands in sharp contrast to the hidden and barely marked wooden building of the Holocaust museum. In her forceful dialogue with us, Rachel impressed upon us the importance of telling the story embodied in The Green House. 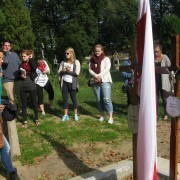 In her presence and in the context of Vilnius, a city that to us, students of memory and reconciliation seemed haunted by the unfathomable fate of its Jewish citizens, the danger of forgetting seemed terribly real. Below we present fragments of Rachel’s message in her own words.